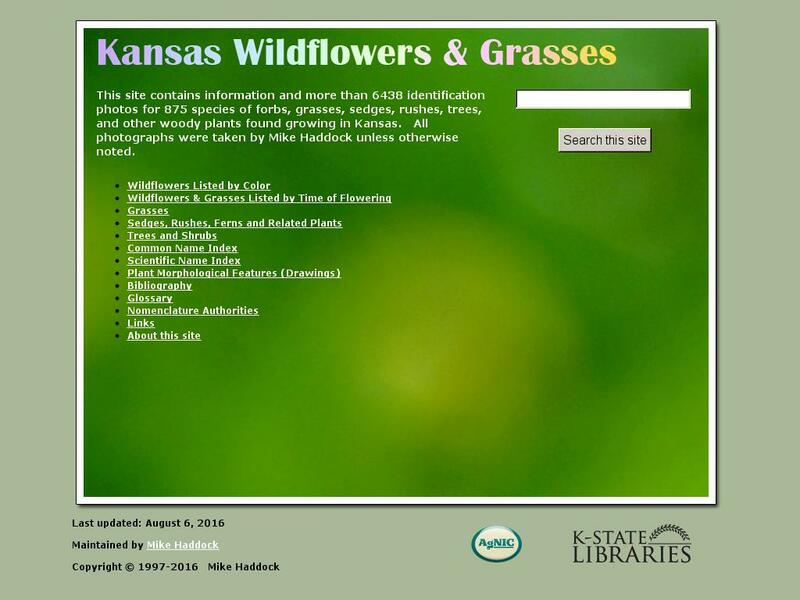 This great online field guide for the wildflowers and grasses of Kansas was created by Professor Mike Haddock, Science Libraries Web Coordinator and Agriculture Librarian at Kansas State University. The site utilizes "more than 1600 identification photos for some 380 species of forbs, grasses, sedges, rushes, and woody plants that are found growing in Kansas." Professor Haddock's well-organized site offers sections that list plants by common and scientific name, grasses and wildflowers by time of flowering, and wildflowers by color. There are also separate sections for the grasses, the sedge and rush families, and drawings that depict morphological features of different plants. The site photos are excellent and the accompanying information is clear and concise. A bibliography, glossary, and list of related links are included as well.